This is Part 1 of my review series on Rosalind Creasy’s Recipes from the Garden , which covers a basic read-through of the cookbook, difficulty level and the quantity of recipes, familiarity of ingredients, and overall production quality. I will start cooking from the book in Part 2. If I don’t do a Part 2, that means I don’t really use the book, which should give you an idea on its functionality. Eventually, I’ll post the verdict, letting you know my overall opinion of things. First, on to the details! Rosalind Creasy has been writing books about edible gardening since the early 80s, when she first published her very popular book The Complete Book of Edible Landscaping in 1982. Since then, she’s written tons of books about growing your own food in your back yard, the most interesting of which (to me, anyway) is Landscaping With Fruit . Being a fruit freak, this sounds like my kinda book. The book starts out with Rosalind’s history of how she came into this specialty of hers and it was actually quite fascinating. 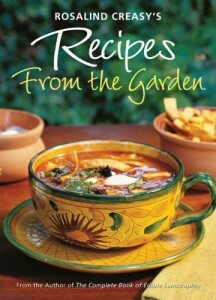 By my count, this book features a total of 188 recipes, which is a ton for the price. Quantity-wise, the Herb Blends and Sides sections come with the most recipes. The photography is beautiful, with the book featuring eye-dazzlingly colorful dishes taken outside in the garden for nearly every recipe. In the sections with lots of recipes, there will be 2 recipes on a page with a full color photo of one of those dishes on the opposite side. One of the most lacking parts of the book is that very little is said about the ingredients, even though there is ample space on the pages to give little tidbits of growing information. It seems that if you want to know more about some of the more exotic ingredients, you need to have one of her other books to go along with this one. It’s definitely a handy cookbook if you frequent farmer’s markets a lot. I did have some concern over some of her ingredients, which sound quite rare, such as the rouge vif d’Etampes pumpkin, pea shoots, and cherry peppers. I haven’t the faintest idea where to even buy these things, so substitutions are definitely in order. While not completely informative in regards to seasons or gardening tips, the book of course focuses on dishes that are easily supplemented with your own produce. The cover is bright and inviting and the photos throughout the book do not disappoint. Although I can’t say I’ll be making salads out of a bunch of flower petals anytime soon, many parts of the book do sound tasty and inviting. The book is chock full of recipes, making this a good value for the price. Recipes I intend to try out include Crab & Asparagus Salad with Fancy Greens and Sorrel Dressing, Strawberry French Toast, Vietnamese Salad Rolls, Japanese Greens with Sesame Dressing, and Carrots with Chervil Butter. Some of them aren’t technically recipes though, such as a recipe for “Steamed Rice”. I doubt any of you are going to go about growing your own rice. The book is nicely organized and introduces novice gardeners and cooks such as myself to new concepts in food, such as flower butters and fresh herb salad dressings. Although teeming with fresh vegetable heavy recipes, Ms. Creasy doesn’t ignore meat-eaters and includes dishes with delicious meats such as duck, king crab, pork, beef, and swordfish. The font is a bit small and the titles can be a little hard to read for certain letters (the ‘T’ looks like a ‘J’) but I like the fact that every other page is dedicated to a color photo. To me a cookbook without photos just isn’t all that interesting and these all serve to complement the recipes very well. In my opinion, little snippets of information on some of the fresh ingredients such as a brief history or growing season would have been pretty useful. For instance, I had no idea what sorrel was until I went to look it up on Wikipedia. A little captioned picture would have helped me out greatly. Overall, it makes me wish I was a retired woman with all the time in the world to devote to a garden. Maybe then I’d be able to plant more things to eat! Disclosure: I received this book from Tuttle Publishing to review. I am not being compensated for writing this review series.